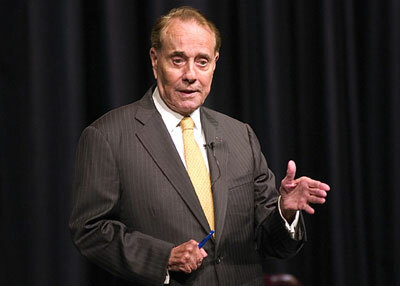 Former congressman Bob Dole tells the SHSU and Huntsville communities of the three things they need in life—patience, a sense of humor and the ability to keep your word—as the university's 12th President's Speaker Series lecturer on Monday morning. But overcoming these bumps was the message Dole presented to his “greatest generation” in a crowded Killinger Auditorium Monday as part of the President’s Speaker Series at Sam Houston State University. “As you get a little older, you look back, and if you have a failure, that’s not the end of the world,” he said. “I’ve never met a person, and I’ve done a lot of traveling, who has said, ‘Bob, I’ve never had a problem.’ I don’t know that there’s a person like that around, and I’m not certain I’d like to meet that person. The former state legislator and U.S. congressman told the audience that there are three things one needs in life: patience, a sense of humor and the ability to keep your word. Working in the political arena taught him the importance of a sense of humor as well, according to Dole. That sense of humor was helpful to him on the late-night talk show circuit with such comedians as Jon Stewart, Jay Leno and David Letterman, as well as on the sets of some commercials he did, including one with Britney Spears “back when she was a good girl. “She got $10 million, and I got a year’s supply of Pepsi,” he quipped. “I think the best line in the book (‘Great Political Wit’) was attributed to Winston Churchill, who was at a big dinner one night and he and the lady sitting next to him got into a big argument back and forth, back and forth. Finally, she turned to him, ‘Winston, if you were my husband, I would poison your coffee.’ He said, ‘if you were my wife, I would drink it,’” Dole said. Among Dole’s Top 10 funniest presidents were Abraham Lincoln (No. 1), who once replied to an allegation that he was two-faced by retorting, “Do you think if I had another one, I’d keep the one I have? ;” Ronald Reagan (No. 2), who addressed criticism of his purchase of B-1 airplanes by saying he thought they were vitamins; and “silent” Calvin Coolidge (No. 3), who would answer all the questions at a press conference with “no comment” and then afterward tell the media not to quote him on anything. Finally, Dole said he learned very early in life that “you’ve got to keep your word. “It used to be that you wouldn’t have to sign a contract; you could just shake hands and that was it. I’m not saying that’s the best way to do it, but keeping your word is very, very important,” he said. “People respect people who give their word and keep their word. As one of the 8.2 million veterans who attended college through the Army GI Bill, Dole stressed the importance of education, one of “the most important challenges in America. Dole told the story of a triple amputee he had visited who used one hand, his only remaining hand, to get out of his chair, get down on the floor, play with his one-year-old and six-year-old and get back in the chair. During those visits, Dole said he’s become “especially inspired by a lot of young people these days because of the sacrifices your generation has made.